There are many different types of skin rashes that can affect men, women, or children. In some cases, the rashes can be easily identified and their cause can be readily determined. In these situations, because of proper rash identification or proper rash diagnosis, the correct and most effective treatment for the rash can be implemented. Unfortunately, in other cases, an accurate rash diagnosis is extremely difficult to perform. The problem lies in the fact that many people experiencing a rash on the skin are not sure of its cause. It is not unusual for a rash to appear on the skin without a cause being clearly evident. Was the rash caused by an allergic reaction to a drug, bug bite, ingestion of a particular food, contact with a plant, or because of some other allergen? Is the skin rash the result of a virus, fungus, or bacterium? How about exposure to chemicals or heat? There are so many factors at play that finding a cause can be extremely difficult to isolate. Therefore, rash treatments are not as effective as they should be because individuals might always be exposed to the skin rash trigger which counteracts the treatment. One of the tools that can be used to find the cause of a skin rash is to read and study other individual’s skin rash experiences. 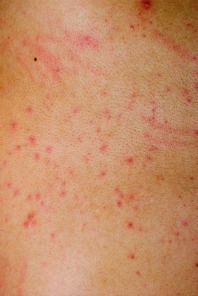 This type of information can also be used in diagnosing a skin rash. By analyzing information provided by actual skin rash suffers, a determination as to the cause of a skin rash may be found. Consequently, effective prevention and treatment can then be put in place. On this page and on several other pages of this website you will find a number of submissions from individuals that are suffering and have suffered from different skin rash types. The database of submissions continues to grow and there is a good chance that you will be able to find similarities with your skin rash problem. A detailed account of the skin rash symptoms. The cause or causes of the skin rash or if not known some possibilities as to why the rash may have appeared. The different treatments that have been tried and the level of skin rash relief that these treatments provided. By providing this type of information about your own skin rash problem, you may be helping others who are struggling with a skin rash. Mysterious Leg Rashes - Lyme disease?